The storm travels upriver and skims over a smooth stretch of water that was once the greatest falls on the Columbia. Celilo. Wyam. Echo of Falling Water. Sound of Water Upon the Rocks. 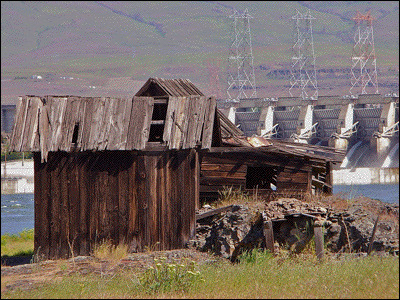 The Old Man of The Dalles once lived here. 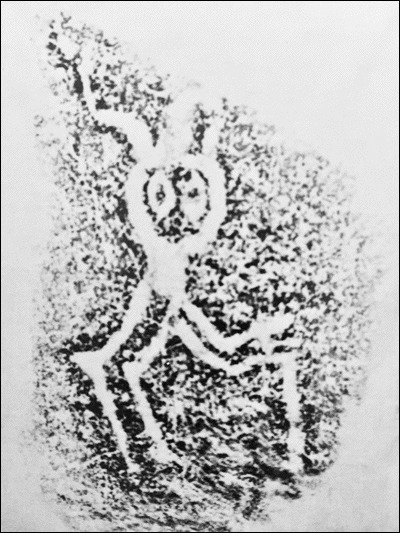 He was one of the ancient Watchers. Carved into rock in the spray of the falls, he watched the fishermen with his big eyes and reminded them to be generous and share their catch with those who had less food. I close my eyes and look through the eye of the storm for the story of that March day in 1957 when the rising backwater of The Dalles Dam drowned the falls. Hundreds of native people lined the cliffs on both sides of the river and watched in disbelief as the floodgates were closed and their sacred falls began to disappear. Sometime earlier, a man climbed out onto the rocks and chipped the Old Man of The Dalles from the cliff. Old Man traveled to the local Chamber of Commerce, out of view of the river. For two decades he slumbered there with a sad stare of half-open eyes. Then one day, like the falls, the Old Man of The Dalles disappeared and was never seen again. I gaze back into the scene of the people watching from the cliffs. With the last Echo of Falling Water, they turned their backs on the river and crossed their arms. Elders sang the death song of the falls. Singing turned to wailing and drifted across the deep hush where the falls once were. Later that night, they walked away. The watching of the falls had ended. The Sound of Water Upon the Rocks had been silenced. That night began a long darkness of native grief that has yet to end. I listen carefully and believe I hear the faint falling of the falls just under the water. Maybe one day it will rise back to the surface. Perhaps Coyote has more changes to make along the Columbia. As I journey upriver, the storm clears and a new day dawns, far to the east. 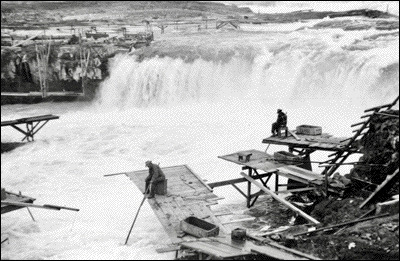 The photos show fishing at Celilo Falls, a rubbing of Old Man of The Dalles (I have yet to find a photo), and an Indian fishing shack below The Dalles Dam.